One of the most popular comic book characters ever created is Superman, and fans of the character debate what his greatest attributes are. Is it the fact that he can run fast, fly or his amazing strength? What if the answer is neither of these? Let’s entertain the idea that his greatest quality is the fact that he has X-Ray vision, because if he can use his vision to assess any approaching danger, he can then determine which one of his other attributes to use. We can say the same for your dentist in Toledo. 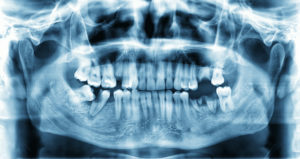 He uses the power of X-Ray photography to gain a picture of your jawbone, teeth and mouth that the naked eye can’t see. Learn more about how this impacts your oral health. Dental X-Rays give your local professional the ability to see inside and between your teeth. Furthermore, they serve as windows that allow him to view the tip of your roots and supporting bone. They are also used to rule out gum disease and aid your dentist in diagnosing other oral problems. Another purpose of X-Rays is to build an oral history, which is integral in monitoring any trends that are developing and the effectiveness of your oral care. Bitewing – This photograph shows the crown portions of your teeth and can reveal any early signs of decay. Periapical – When your dentist wants to make an assessment of the bone height of your teeth or the root tips, this is the image of choice. Panoramic – For an image of your whole oral cavity, your dentist will use the panoramic X-Ray. It can identify impaction, cysts, tumors, and jaw disorders. The general protocol for when to take the different types of X-Rays is to take the bitewing image every 12 months and a full-mouth set every five years. However, if you have a history of dental caries (cavities), the latter may be recommended every six to 18 months. This increased frequency serves as protection for you because, if you have a history of dental caries, that increases your chances of having advanced tooth decay. Thus, by monitoring your mouth closer, your dentist can catch a budding issue earlier and act on it before it becomes a big problem. The basic premise here is that an ounce of prevention is worth more than 10 pounds of cure. So your dentist in Toledo uses the super power of being able to peer into your mouth to guarantee that you have optimum oral health for years to come. Dr. Richard Thomas received his undergraduate in medical technology from Michigan State University. He then went on to earn his Doctor of Dental Surgery degree from Case Western Reserve University, followed by a one-year residency. Dr. Thomas practices at Dental Group West and can be reached for more information through his website.